Raasay lies to the east of the Isle of Skye in the Inner Hebrides. 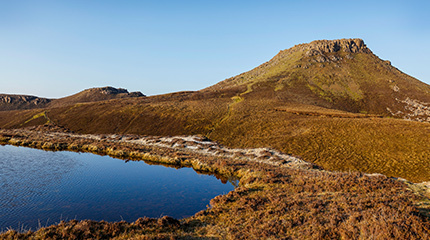 Within a corner of the world known for its breath-taking natural beauty, rugged and exaggerated landscape, Raasay boasts a unique geology, history and community of its own. From Bonnie Prince Charlie and celebrated Gaelic poet Sorley MacLean, to Calum’s Road built single handedly by hand over 10 years, illicit distilling in secret caves and one of Scotland’s most incredibly diverse ecosystems, Raasay never disappoints its visitors. Translated as ‘island of the roe (or red) deer’, Raasay boasts a diverse geology, forged in volcanic fires. Hence the minerals that imbue the water from our ancient Celtic well, quaintly named “well of the pale cow”, representing fertility of the land. We are determined not to disturb Raasay’s rich biodiversity. As part of pre-planning for the distillery we surveyed for indigenous creatures the Raasay vole, otters (of which we have one on site), and bats – hundreds of which inhabit the roof of our Visitor Centre including the UK’s most North-Westerly population of Brown Long-Eared bats. Harnessing the raw elements of water, and for special releases local peat and barley, we apply our expertise to create and fine-tune a range of expressions. Thus the essential nature of the Raasay terroir will be brought to life through premium Scotch whisky. Raasay dates back to the Gaelic Kingdom of Dalriada in the 6th Century and became a Norse subject in the 8th Century. It returned to the Kingdom of Scotland in 1266 and was ruled by Clan MacLeod until the Battle of Culloden in 1746. After his defeat at Culloden, Bonnie Prince Charlie sought refuge on Raasay as he fled (from the English) with Flora Macdonald. Raasay is also the birth place of Sorley Maclean, one of the most significant Gaelic poets in the 20th Century. Roughly the size and shape of Manhattan, there are just 160 residents on Raasay, in addition to one hotel, three bed & breakfasts, two shops, one primary school – and now a distillery – that make up the island’s close-knit community. The Isle of Raasay Distillery was designed by local architect Olli Blair, and built by the hands of several islanders. There were jubilant scenes at the opening ceremony as almost the entire island turned up to celebrate the historic occasion.